Spring in the woods means only one thing to lots of people: bluebells! Vibrant carpets of the delicate cyan flowers are a quintessential British experience at this time of year. 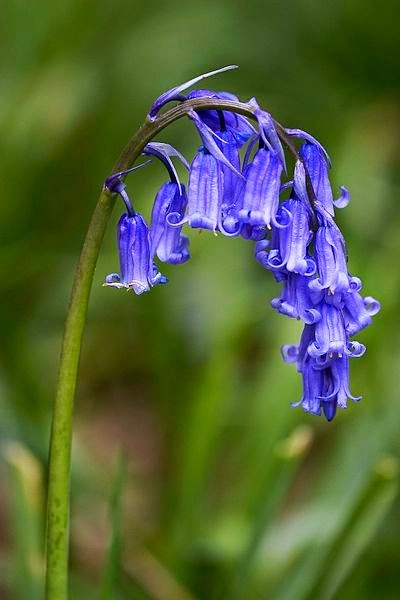 And it’s not just a spectacle; Britain is home to fifty percent of the world population of this species of bluebell. As plants recolonized the northern latitudes after the last Ice Age, bluebells reached Britain just before the sea level rose and cut us off from the continent, so lots of other plant species never arrived here. In the rest of Europe, bluebells are out-competed by some of these species, whereas in the UK they are free to thrive. But I’d like to take you beyond the bluebell. Although bluebells are spectacular, my favourite time of the woodland year is actually a couple of weeks earlier, when some of the other woodland wildflowers are the real first sign that spring’s on its way. Like bluebells, these plants have adapted to life in the woods by flowering before the trees are in leaf, so they make the most of the sun. They don’t always form such a dramatic carpet on the woodland floor as bluebells, but often the fact that a number of different species are clustered together - with their diversity of colour - makes for a sight to gladden the soul. Wood anenomes Anenome nemosa are one of the most important indicators of ancient woodland. They reproduce through rhizomes (root-like structures) that only spread about six inches a year – this means they don’t colonise new sites easily, and the presence of a large population means that a wood has been undisturbed for a very long time. They can also provide an interesting clue to previous land uses, as they're sometimes found on open ground – but this is a strong clue that the area has been wooded previously. Like wood anenomes, lesser celandines Ranunculus ficaria can be found in a variety of habitats, but usually give us a clue that the area has been wooded at one point. 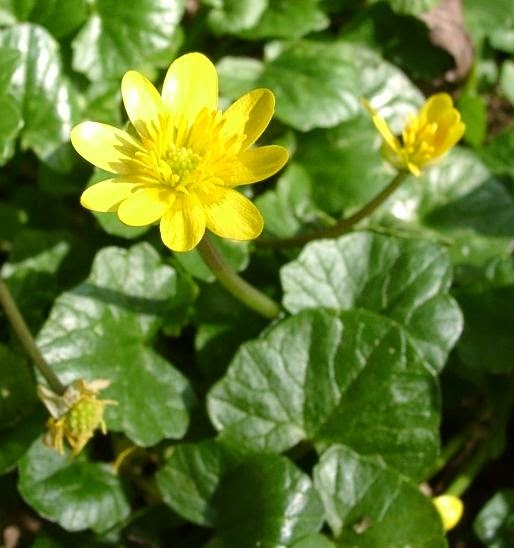 It is sometimes known as ‘the spring messenger’ as one of the earliest flowers, and William Wordsworth was inspired to write three poems about the plant – famously, however, the celandine carved on his gravestone is the wrong species, the greater celandine. It is also sometimes known as pilewort because there is an old folk belief that the crushed roots could make a lotion for piles when mixed with wine or urine! Wood sorrel Oxalis acetosella is probably my favourite woodland wildflower despite its ubiquity. It particularly thrives in cool, shady woods - of which there's no shortage round here - and can tolerate shade much darker than other plants. In the Lakes, it often grows out of the mossy carpet on the woodland floor or even from moss growing on tree branches, creating lush hanging gardens in the canopy. The leaves are delicious and taste of apple peel, but don’t eat too many as they also contain Oxalic acid. 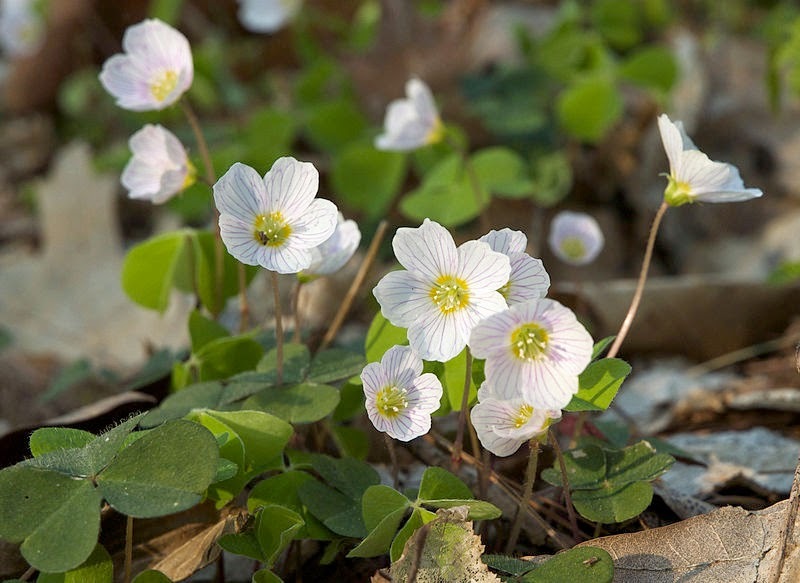 Wood sorrel is one of the more widespread flowers globally and is native as far north as Iceland, south down to Greece, and east as far as Japan! Wild garlic Allium ursinum is another very common flower of damp woodlands and lends the woods their distinctive garlicky aroma in early spring. The latin name means ‘Bear’s garlic’ and is so-named because where they still exist in Europe, brown bears love to truffle up the roots! 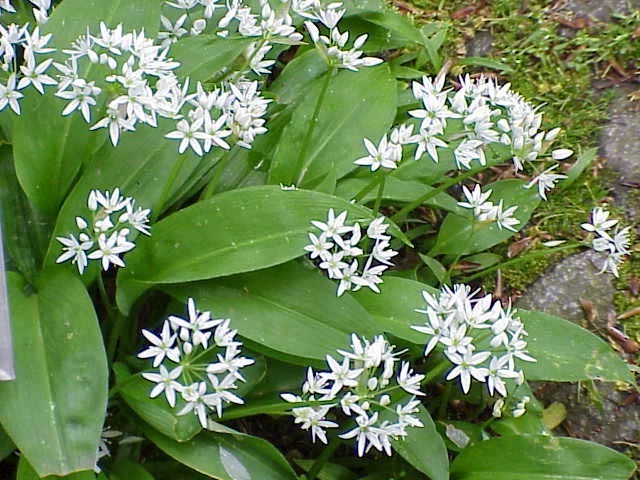 Both the leaves and flowers are edible and have a more gentle taste than culinary garlic – wild garlic risotto is a personal favourite. Primrose Primula vulgaris has been under threat in England over the last few decades because of people digging plants up to put them in their garden – fortunately attitudes have changed and this sort of thing is much less common now. Primroses can be seen anywhere that’s undisturbed, cool and slightly shady, so our Lake District oakwoods are great places to find the lemon yellow rosettes. Get out and see 'em! The South Lakes is home to lots of fantastic native woodland so it’s the perfect place to get out and see woodland wildflowers in the spring. The woodlands on Windermere’s west shore, along the Yewdale bridleway, above Glen Mary car park, or along Coniston’s east shore are particularly special places with rich flora and incredible atmosphere – make sure you don’t miss the spectacle, it changes day by day at this time of year! 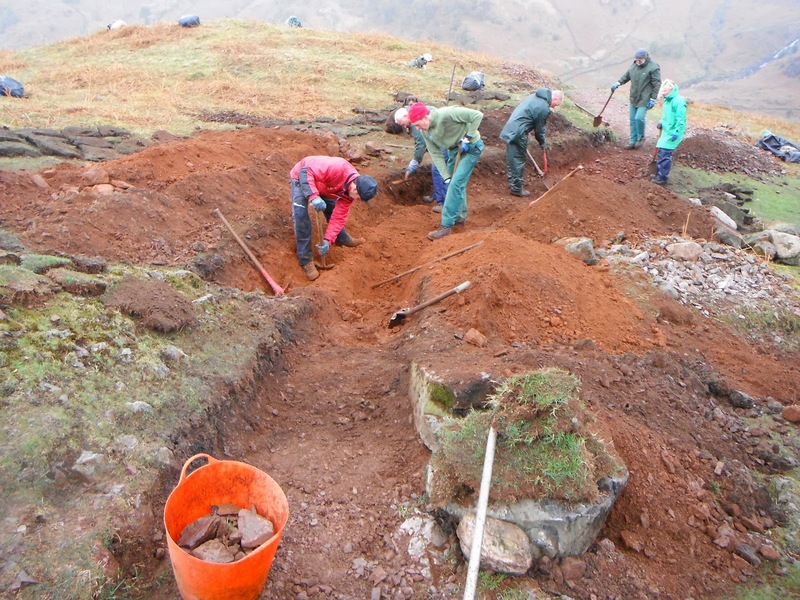 As part of our continuing repair work on the Helm Crag path, we recently arranged a weekend work-party with the Fix the Fells volunteers. Our task was to continue a section of path using the subsoiling technique, which you can read all about in a previous blog post here...National Trust Working Holiday on Helm Crag. The photograph below shows a section of completed subsoiled path, just before the area to be worked on. 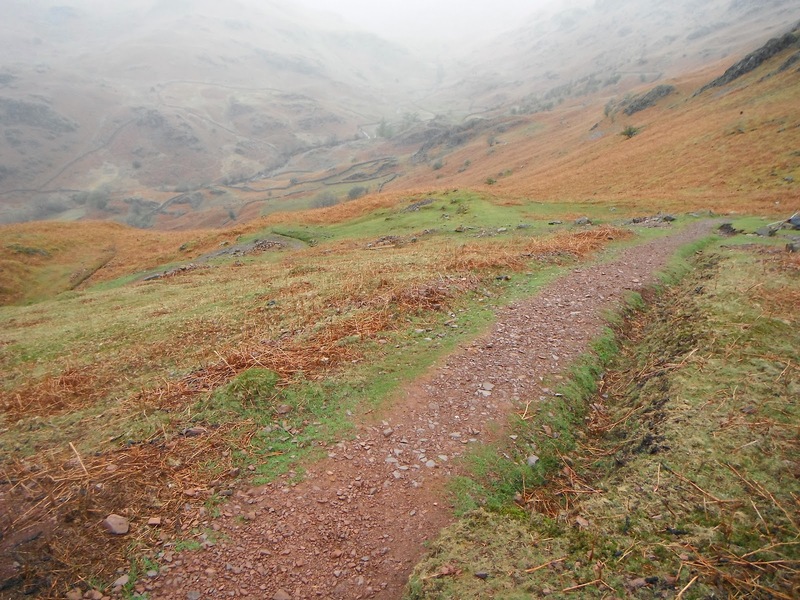 The work involved linking the path that we'd previously repaired to the original path-line. In the photograph below you can see the original, eroded path to the left of the photo and a bare area of grass to the right where our new path will go. In just a few hours, most of the path had been dug off and we managed to find plenty of the red sub-soil which makes an excellent topping for the path. We blocked off the old path (which you can see leading to the right in the following photograph) with some large boulders and used some excess soil to cover the eroded areas. At some point in the next week we'll put some grass seed down on this fresh soil to help green up the area. 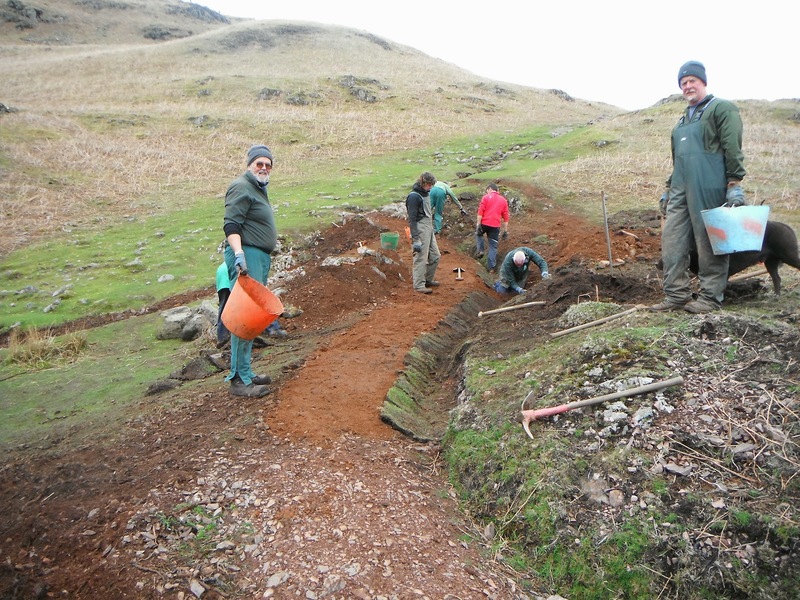 By the end of the day we'd completed the path and a turf-lined side drain which will now provide a more sustainable surface on the route to the summit. 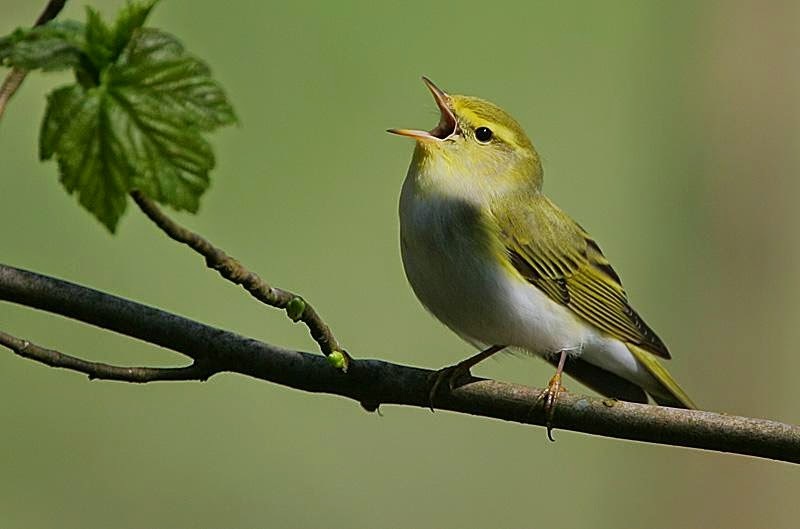 Same nest, different tenants - squatter's rights for birds! 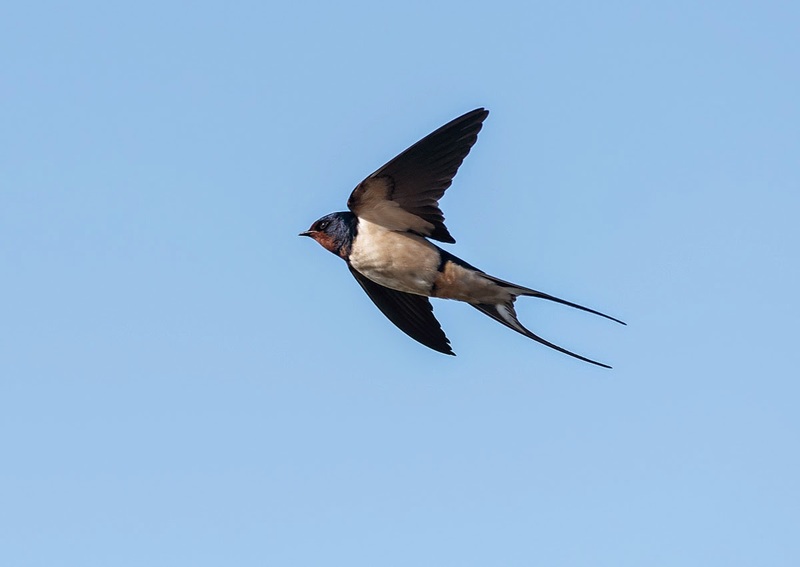 Everyone know it’s good to recycle or if possible re-use, but it’s not just us that does this.Two summers ago we noticed Swallows taking a great deal of interest in the toilet block at the volunteer centre here at High Wray. We always keep the door shut, to stop them flying in and getting stuck, but in this instance they were interested in the alcove above the door – an ideal nesting spot it would appear. Over the course of a couple of weeks we watched the nests build up, with both adults bringing in mud and plant material to make a lovely firm construction. Soon after completion we were delighted to spot the female sat on the nest. We were worried at first that she’d be put off by people heading in and out of the loo, but she’d briefly exit the nest whenever anyone passed before quickly returning. A couple of weeks later we noticed she was exiting the nest a little more often and spotted tiny fluffly feathers poking out over the rim of the nest – they’d hatched! It took about another 3 weeks for them to steadily grow to the point where they were hanging out over the sides and it seemed a wonder they didn’t force each other out of the nest! Shortly after that, we checked one morning to find they’d all gone (without so much as a thank you). The next year we hoped they would return as Swallows will often repair and re-use old nests, but were disappointed to see no sign of action. By the end of the summer the nest above the gents loo door was starting to look very run down, with the ladies one holding together much better. So we had our fingers crossed for this year but it looks like someone beat the swallows to it. It appears that a Wren has decided the ‘ladies nest’ would make a perfect base for its own construction and has built an exquisite (and very snug looking) extra layer on top of the original base. It looks like it had a go at the ‘gents nest’ as well, judging by the tatters of moss poked into some of the holes, but obviously agreed with us on the state of it and must have given it up as too much hard work. We’re not sure if this adapted nest has ended up being chosen by the female Wren (males normally build several nests, from which the females chose their favourite), but we’ll keep an eye on it over the coming weeks. 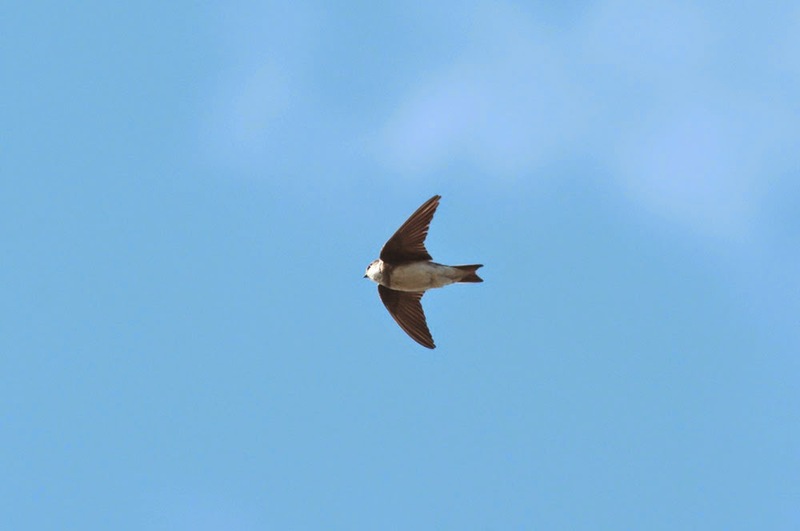 One things for sure, with the swallows having just reappeared on the scene here (see last week’s entry on migration) they’re likely to get a big surprise if they decide to return to this particular site! 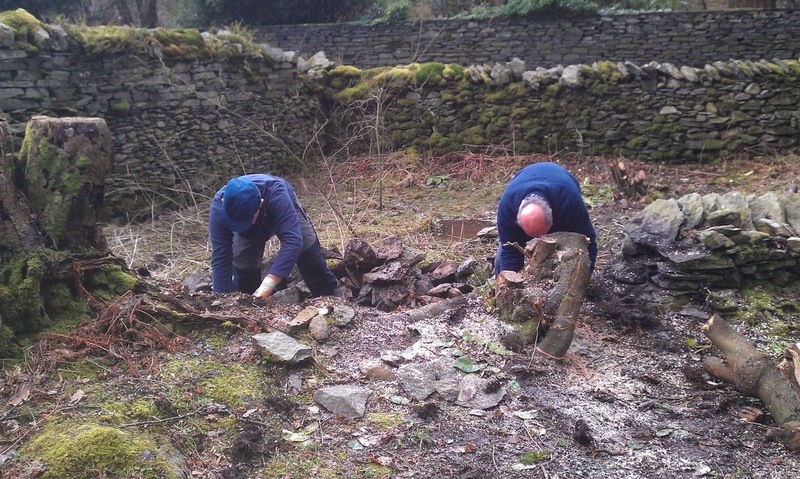 Since finishing the tree cages we've mostly been working over at Aira Force, carrying out some urgent path repairs. One section we've been working on can be seen in the photo below. It shows the original path to the right, which people had started to avoid due to the bedrock that is protruding. A new, lower path had started to form, which is potentially dangerously close to a steep drop down to the river. Firstly, we moved some large rocks from the original path to form an edge to the lower path. Any bedrock sticking up into the new path was broken with crowbars and sledgehammers until it was low enough to cover with gravel. As well as using the stone from the old path, we gathered some large boulders from higher up the bank to continue the edging. This would help keep people away from the edge of the river bank and give us a suitable edge to gravel against. The next job was to dig a trench to divert any water off the new path; this fed into a pipe underneath the path and out into the river. Ideally we'd have built a stone drain but there was not enough suitable material nearby so we had to make do with plastic pipe, though we made sure it was well concealed. With the new edging and drainage in place all that was left to do was the graveling. We put some turf over some of the path edges and we 'll put grass seed down to help the soil revegetate more quickly and soon you'd never know the other path existed. The new path is now much safer, easier to use and a much better line. It'll allow people to enjoy there surroundings and not have to think as much about where they're walking. Well, the good weather continues and we have lots of visitors who are making the most of it. If you are planning to come for your first visit, there is no better place to start than here around the Borrowdale and Derwentwater area. Regular visitors will be noticing that the Trust is introducing some new features that we hope will be enhancing your experience. 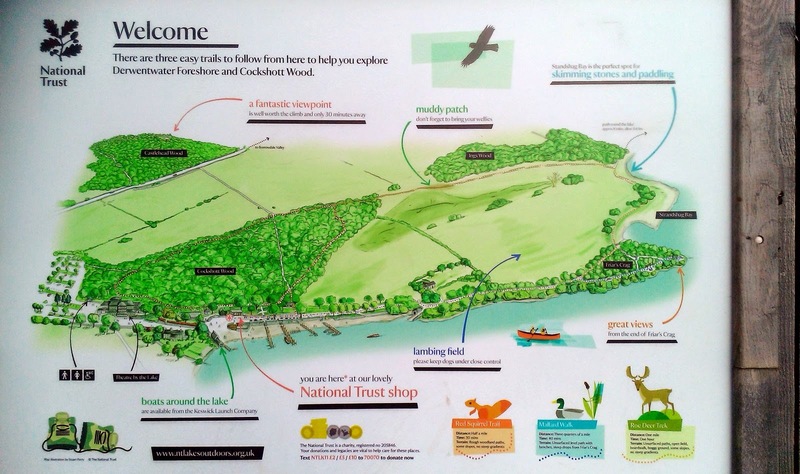 A good place to start for family walks is by the Trust shop on the shore of Derwentwater. Outside the shop there are some boards showing suggested walks that take in lake shore and woodland. You can also find similar boards at many of the car parks. 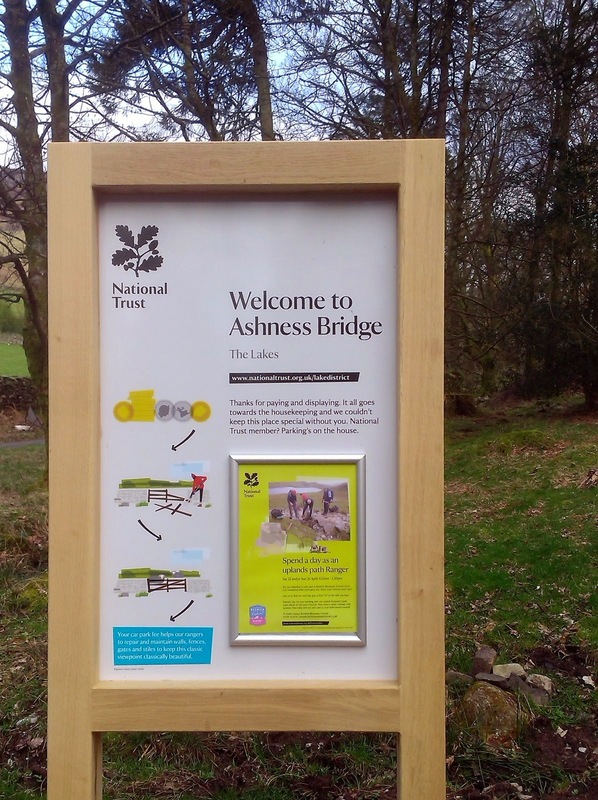 Another new venture can be found at Ashness Bridge. 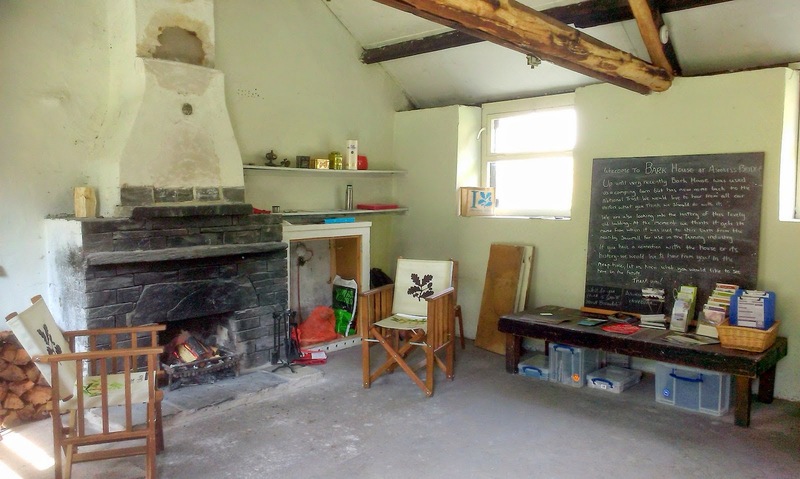 You might remember that I mentioned a small building called Bark House that was wrapped in sheep fleeces as part of C-Artlast year. It was returned to the National Trust recently and we are currently working on the best ideas for its use. For the time being, we are opening it with some of our volunteers who will chat about the surrounding area. On cold, wet days you can also pop in and enjoy a nice log fire. But, of course, there is nothing better than having you come and introduce yourself to us when you see us. That is one of the best ways for us to find out if you enjoy what we are doing. Access Improvements to Moor How. Moor How (height: 229m/751 ft.) overlooking Park Cliffe on the South East side of Windermere. 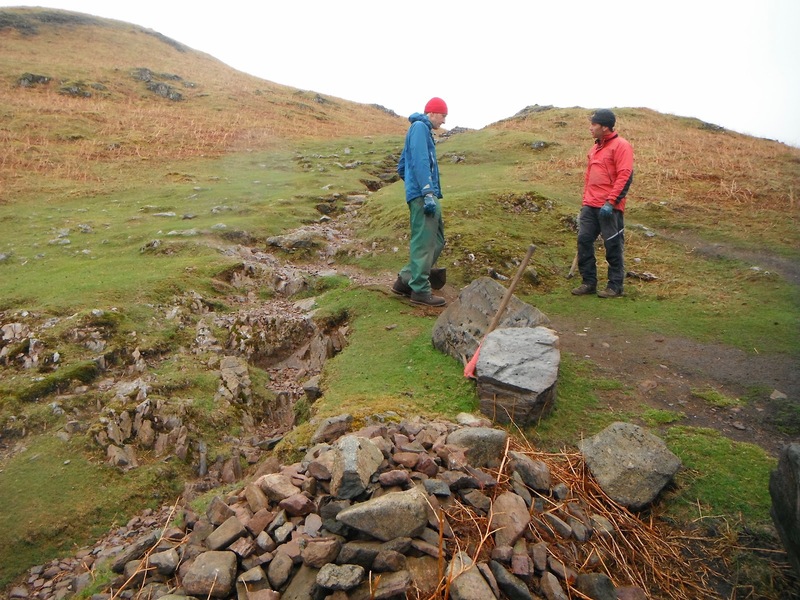 James Archer, N.T Area ranger for Windermere and Troutbeck, was keen to improve access to Moor How. The footpath goes through Parkcliffe Camping and Caravan Estate land with access on to National Trust land leading up to Moor How. Access to Moor How (meaning moorland hill) is over the boundary wall via a stone step stile...quite difficult to negotiate and deters some people, especially for those with dogs. James proposed taking a section of wall down to allow a self closing "wicket gate" to be installed. 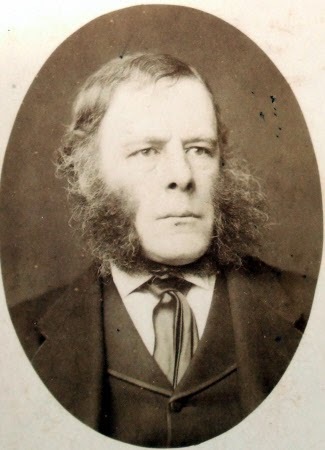 When consulted, The Lake District National Park Authority were in favour as were the proprietors of Park Cliffe, Mr. and Mrs. Dickson. Thanks are owed to Mr. and Mrs. Dickson for their generous donation towards the cost of the work involved. Topsoil and gravel was also made available from Park Cliffe. As well as improving access for walkers, removing the step stile will potentially make the boundary wall more stock proof. 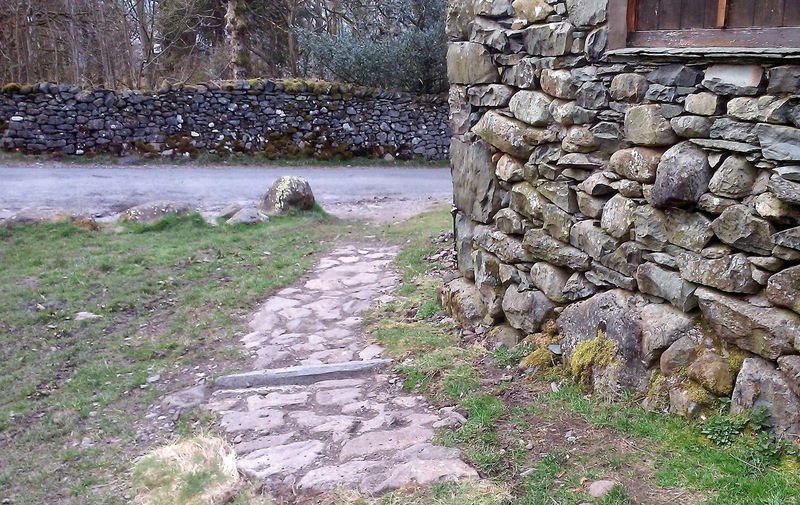 Sheep in some areas have learnt how to negotiate stone step stiles as shown in this recent image! The wall in the process of being taken down. Because the boundary wall was built over bedrock, the gate pins were concreted directly into the wall...digging a hole for a conventional gate post was not feasible. The closing or clacking post was anchored on the opposite side using threaded bars encased in concrete. The wall is nearly rebuilt with the top gate pin clearly visible. The top and bottom gate pins are offset. This will make the gate swing shut when released from the opened position. Landscaping work below the relocated path. .....and a hazy view of the Howgill Fells to the east. Stands of gorse are a feature of Moor How. In flower, mid April. A geological fold in the rock formation, near the summit. Spring is finally here. 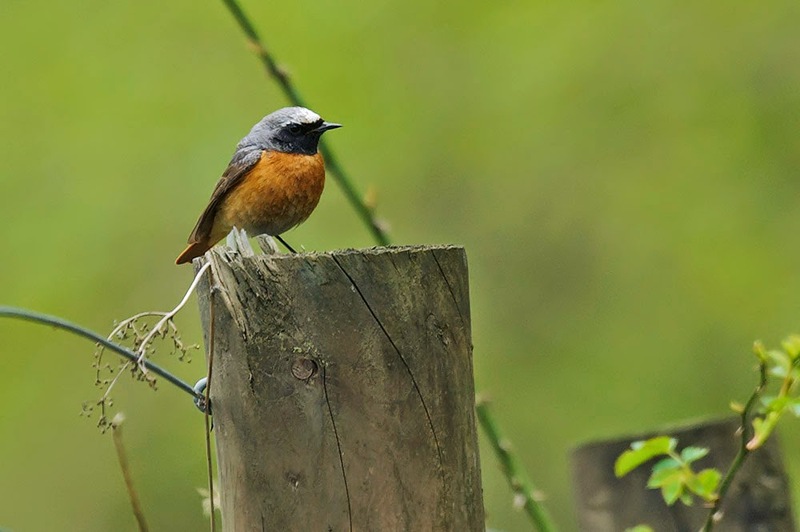 As most of us contemplate what and where we are going on our summer holidays this year, the mass summer migration has begun for Britain’s wildlife. Could you imagine having to travel half way around the world to get to your destination, only to then repeat the same journey four months later? No nor can I but that’s exactly what hundreds of millions of our summer migrants do every year. 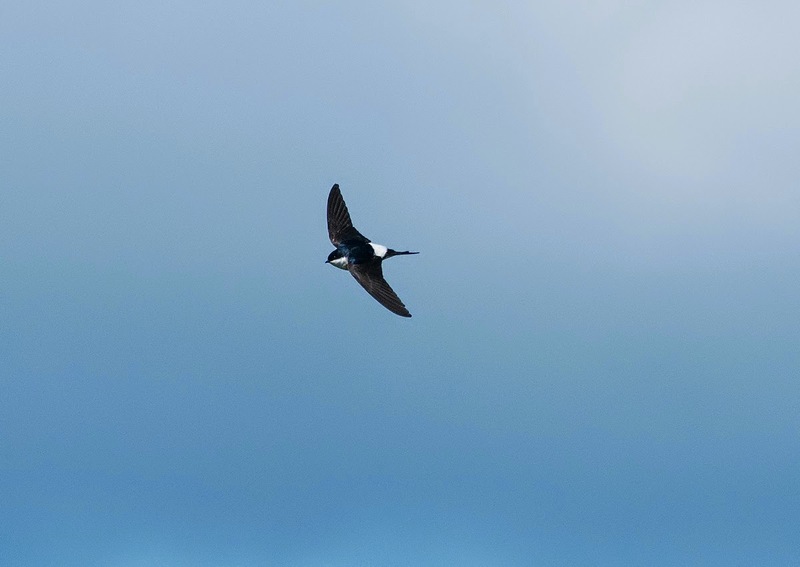 Bird species such as Wood Warbler, Redstart, Cuckoo (arrive early April and leave by end of June) Swallow, House Martin, Sand Martin, and Swift (last to arrive and first to go) arrive in the spring and have traveled for thousands of miles from either North-West or Sub-Saharan Africa. 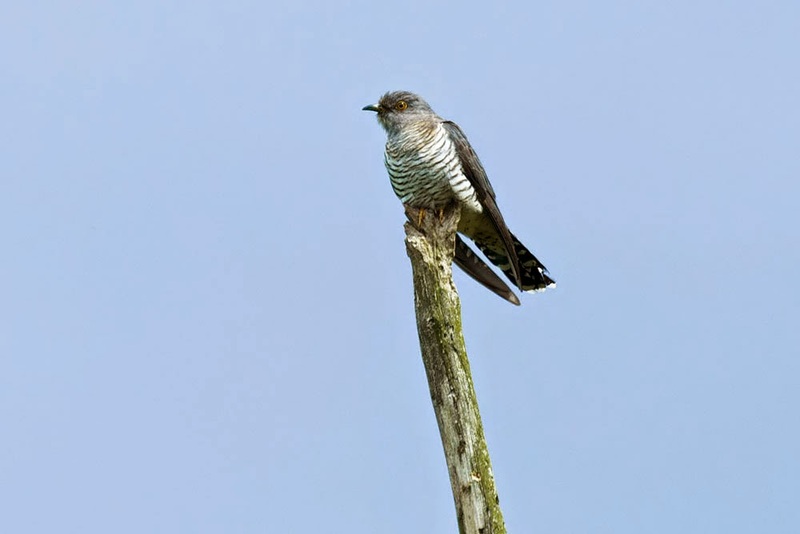 These species come to Britain to breed because the further North they go, the greater the abundance of food and more light in which to search for it. Would you believe that some of our butterflies and day flying moths migrate to the UK too? 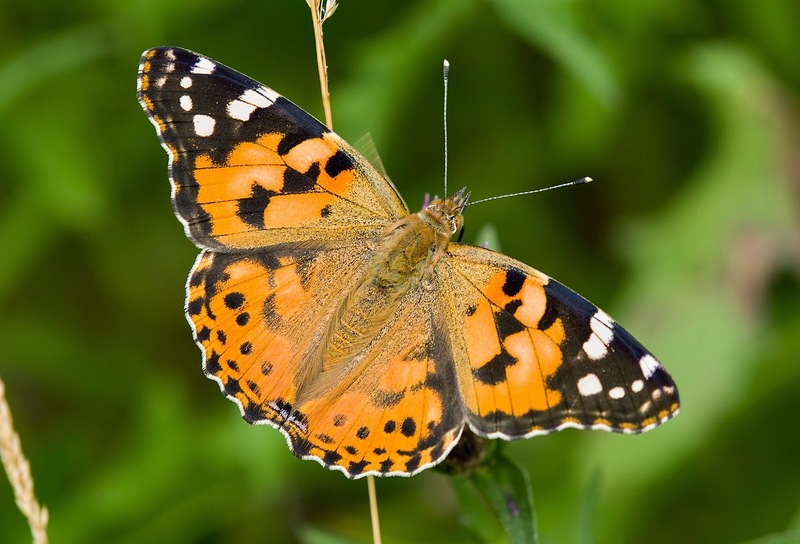 Take the Painted Lady for instance; this migrates from North Africa, the Middle East and Central Asia, which is somewhere in the region of 9000 miles and at altitudes of over 1,000m. For a tiny creature weighing less than a gram, with a brain the size of a pin head, and no opportunity to learn from older, experienced individuals, undertake an epic journey. It’s estimated that 11 million arrive in Britain each year, with around 25 million migrating back by the end of the summer. 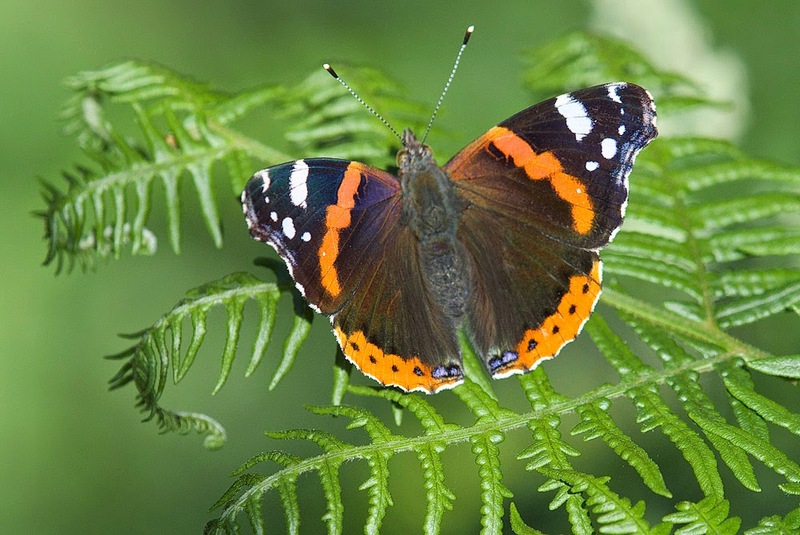 The Red Admiral like the Painted Lady is another migrant to Britain, flying from North Africa and Continental Europe in there millions and covering similar distances as their counterparts. 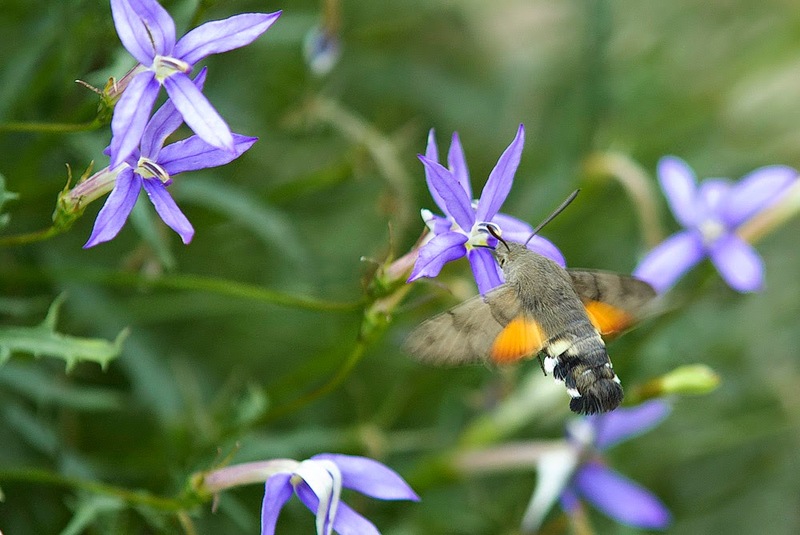 The Humming-Bird Hawkmoth is a day flying moth that also migrants to Britain. These arrive in there thousands every year. Historically these were usually frequenting the South and East of the Country, However due to changes in our climate and hence warmer summers; they are being seen in Cumbria in larger numbers. 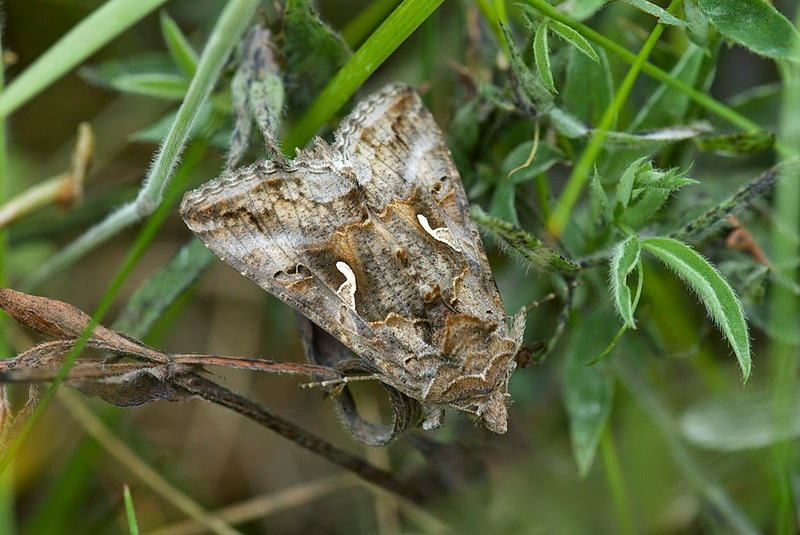 The Silver Y moth is our most common immigrant moth from Southern Europe, North Africa and parts of South East Asia, which can arrive in numbers up to 250 million in a good year (yes that’s correct you read it right! ), with a staggering four times as many leaving as arrived. If there is one story that shows the character of William Wordsworth then it is surely the story of Dora's Field. This small patch of land in Rydal, cared for by the National Trust since 1935, hosts one of the least well-known stories of the great poet. Wordsworth and his family rented Rydal mount, the large country house that can be seen from Dora's field, from Lady Anne le Flemming from May 1813. In 1825 Lady Anne announced her intention of giving the tenancy of Rydal Mount to a relative. Under threat of eviction, and desperate not to be forced away from the idyllic Rydal, William purchased the field (then known as 'The Rashfield' - the damp land was full of rushes) and made it clear to Lady le Fleming his intention of building on the field in what ever way he wished (this would have been right in the view from Rydal Mount). George Webster, a famous Kendal architect, was even paid to draw up a design. The threat was enough and Lady Anne backed down, and Wordsworth gifted the field to his daughter Dorothy, hence the new name 'Dora's Field'. When Dorothy was diagnosed with leukemia Wordsworth cancelled his travels and they spent her final few years together. When she died Wordsworth and his gardener planted hundreds of daffodil bulbs in her memory - the same flowers that can still be seen today (quite literally on this occasion - see picture below). In preparation for this years daffodil display our staff and volunteers worked hard to clear the pathways from the winter build-up of leaf litter, clear back some scrub from the daffodil areas and remove some of the invasive Cherry Laurel trees from the garden borders to prevent further spread. Once established Cherry Laurel puts down a poisonous ground layer of chemicals that stop any ground flora from growing, decreasing the value of the area to wildlife. 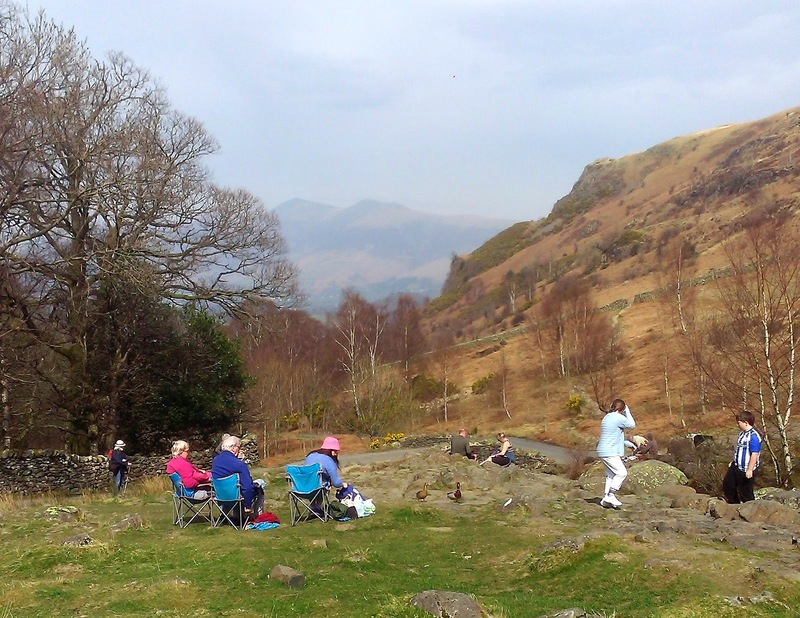 Dora's field is open all year round and is located in Rydal next to the Badger Bar on the A591 between Ambleside and Grasmere. 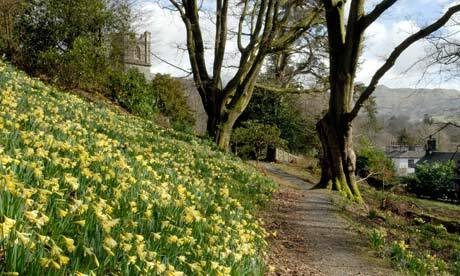 The daffodils are still in full bloom and will be followed by an excellent display of bluebells and wild garlic. As in most of the UK, we have been having a run of beautiful Spring days here in the Lakes and the daffodils are in full flower. The combination of the weather and schools' Easter break has meant that we've had lots of families with children visiting. So, we have been busy organising a day of activities for families. On days like these we have to make an early start setting out things and this year we had a misty start. 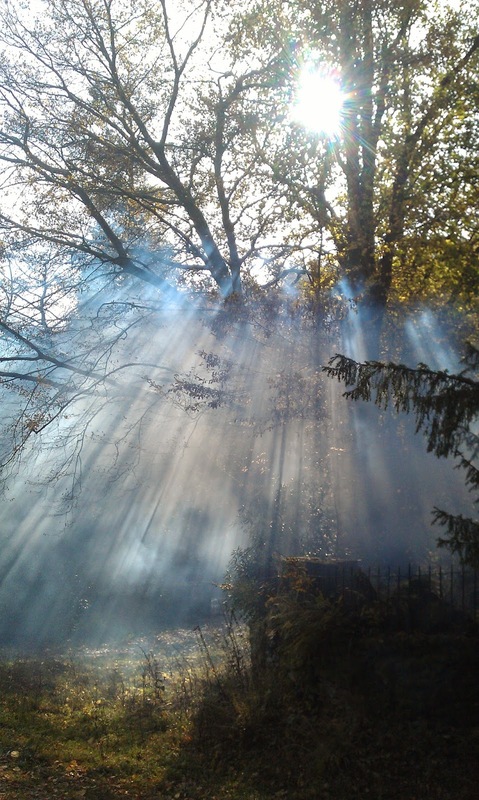 Once the sun was up, the mist burned off and it was a bright sunny day that was also very warm in sheltered places. 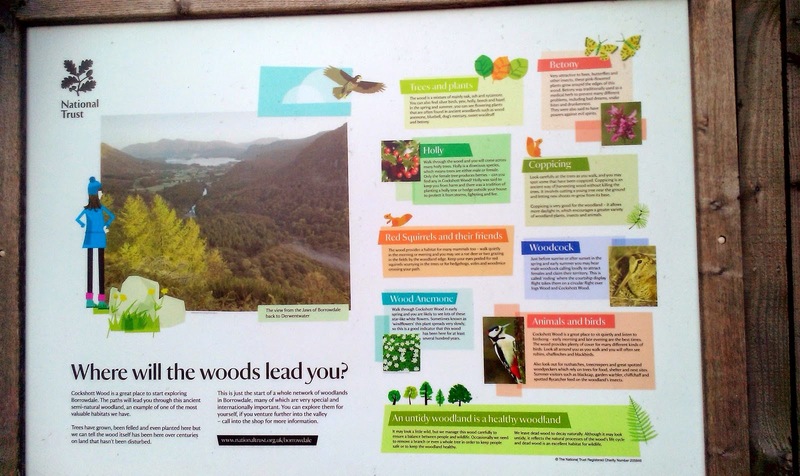 Those who joined in had the opportunity to do a trail starting at the National Trust shop by Derwentwater. This took them through Cockshot Wood which had some unexpected things to discover. If you haven't walked through the wood before, it really is worth doing especially with children. There are lots of surprises for them to enjoy. We have some big spiders! On completing the trail, there were the traditional chocolate eggs of course. It turned out to be too busy a day to take lots of photographs but I'll add more if anyone else managed to take some. I wasn't at the Easter event. I don't know why. I know chocolate eggs are bad for dogs and I don't think I would have eaten any. The Borrowdale Volcanic Group underlies the highest and craggiest central part of the Lake District including the Langdale and Scarfell Pikes. These igneous rocks are volcanic lavas and ash flows erupted during a phase of cataclysmic volcanism 450 million years ago. Ash exploded out of a volcano, may fall through the air and settle in beds, when compacted and cemented these are called tuffs. The fine grain tuff located in a band of outcrop rock which extends around the summits of Langdale, Bow Fell, Scafell and Glaramara is the source of material for the Langdale axe production sites. This band has been eroded by glacial action and detached blocks of the tuffs are present within the morainal mounds and scree slopes below. The majority of axe production sites were directly associated with the outcropping of this source material on either the face of Pike of Stickle and Harrison Stickle or the South scree gully. 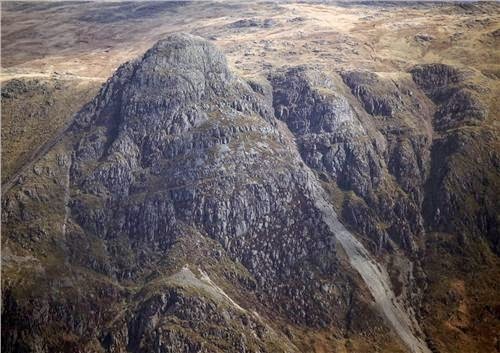 Debris and hundreds of "reject" axes have been found on the scree slopes of Pike o' Stickle. Pike of Stickle and scree gully. The initial identification of axe production in the Langdale area was on Mart Crag Moor between Stake pass and Pike of Stickle. 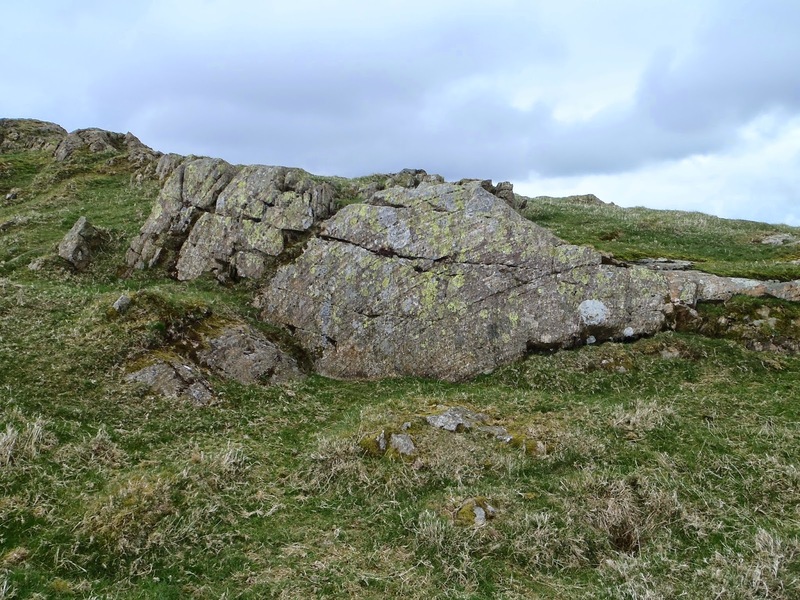 Below is a more resent discovery in 2008 on the moraines on Mart Crag Moor. 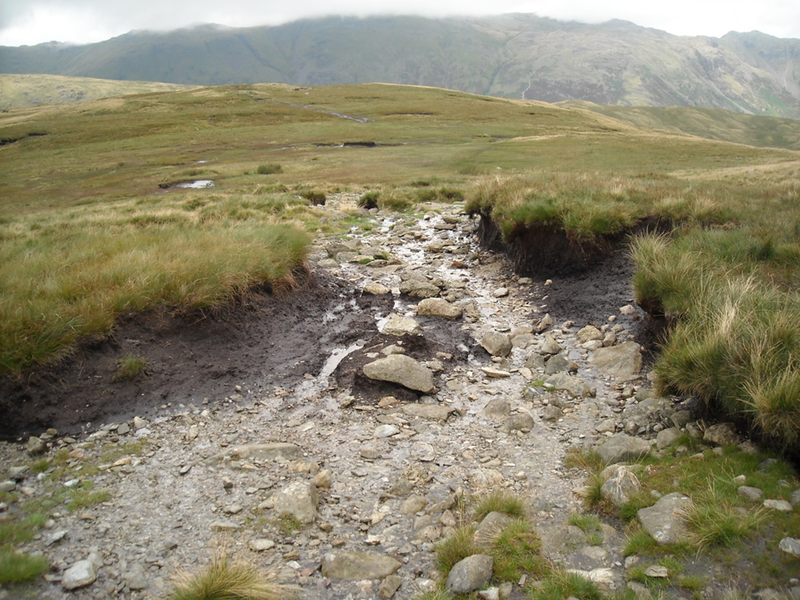 A footpath over Mart Crag Moor had formed a large erosion scar due to inadequate drainage. Consequently this exposed a previously unknown Neolithic axe manufacturing site. Mart Crag Moor axe production site. 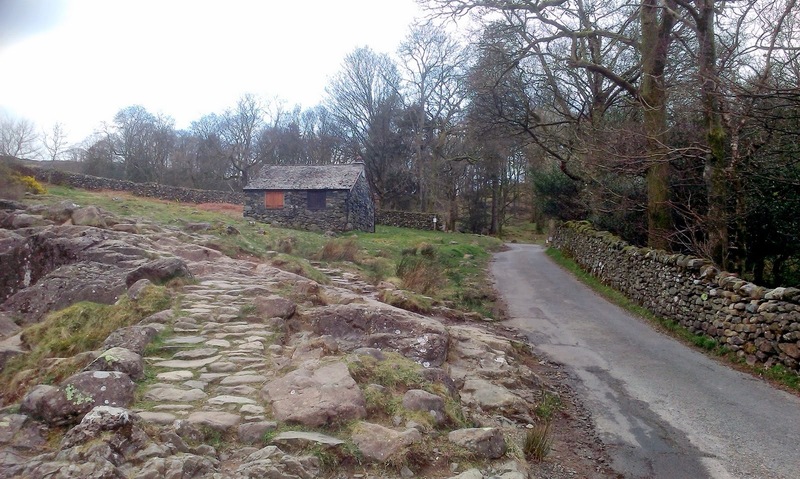 The Neolithic axe factory Sites in the Langdales and Scarfell are where the rough outs of axes were manufactured. 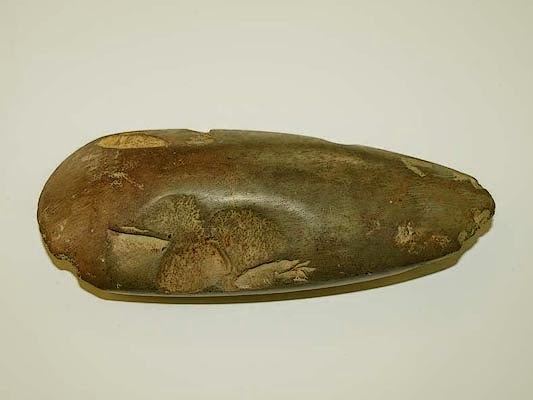 There is evidence that sandstone grinding slabs found on the Cumbrian coast were used to polish or finish these greenstone axes. Polishing the rough surfaces will have improved the mechanical strength of the axe as well as lowering friction when used against wood. Of all the Neolithic polished stone axes that have been examined in the UK, around 27% come from the Langdale region. Neolithic axe factory sites of Langdale and Scarfell Pike in Cumbrian, together with Grimes Grave in Norfolk represent the earliest industry of true mass production in Britain. 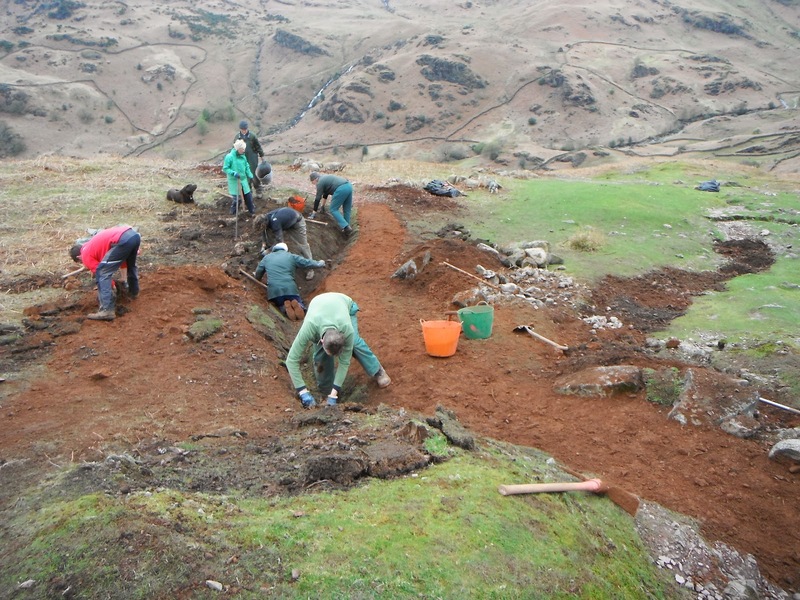 Over the past few weeks we've continued our lower-level work around Grasmere, Great Langdale, Troutbeck and Windermere. One of our jobs was to replace a gate at the top of Deerbolts Wood near Loughrigg Common. As you can see in the photograph below, the old gate had certainly seen better days. The long-term plan is to have an oak gate at this site to match those at High Close Gardens and help to identify the site as part of the High Close Estate. But with it being such a well used path it needed a temporary fix, so we decided to replace it with a softwood gate. We've also spent a fair amount of time tree-planting and constructing tree cages in conjunction with our farm tenants. The tree cages below were built on one of our tenanted farms near Orrest Head, Windermere. A single native tree is planted in each cage, which is designed mainly to keep cattle from grazing or pushing against the trees, giving them time to properly develop into large standard trees. It's nice to think that in a hundred years time the saplings that have been planted in these cages will be a feature of the landscape overlooking Lake Windermere. There are days in Borrowdale when if I took photographs of the same view at hourly intervals it would almost be possible to believe they were taken over the four seasons. The following pictures were not taken like that but they do show the constantly changing skies and light which can be overlooked if we focus all our attention on lakes and mountains. All it takes is for one cloud to shift and the light changes to create a completely different experience of the landscape. I know it’s a bit late but happy Chinese NewYear , it’s the year of the sheep lucky numbers 2 and 7 lucky colours brown , red and purple. Of course every year is the year of the sheep in the Lake District , sheep have been an important part of the culture, economy and landscape here for over a thousand years. 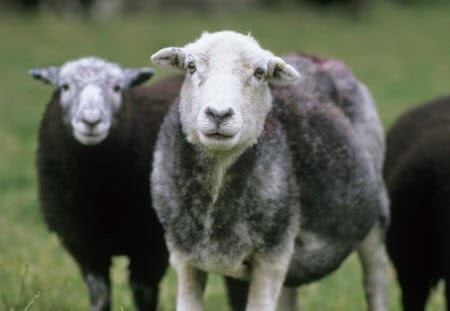 One breed of sheep has a particularly strong connection to the area, reportedly brought over here by the Norse Vikings , Herdwick sheep have been grazing on the Lake District Fells ever since . They are a hardy breed , stocky, short legged and with thick wiry wool , at home in the mountains they live up there almost year round at altitudes of up to 3000ft, without needing any supplementary feeding , their ‘ low maintenance’ has made them popular with generations of Cumbrian farmers. Sheep farming and the wool trade has quite literally changed the face of the Lake District , old pack horse routes are now our main roads, we still have narrow pack horse bridges over the becks and the flagstone and drystone wall boundaries that we see today, were built to keep sheep in the fields . The Herdwick sheep are unique in many ways , the ewes , because they are a mountain breed usually lamb later in the year when the weather is kinder and the grass has started growing . The higher fell farms will start lambing in April when other lowland farms lamb in February . The purebred ewes usually have only one lamb , the lambs are born black and their fleece gets lighter and greyer as they get older. As I get older I find my fleece is getting greyer as well ! Herdwicks are definitely part sheep part goat, they are agile climbers , helpful when you have to graze on rocky crags. I have seen herdwicks climb high walls with ease and on one occasion saw a herdwick jump straight over a stock fence with barb wire on the top , just because there was the prospect of a better meal on the other side ! 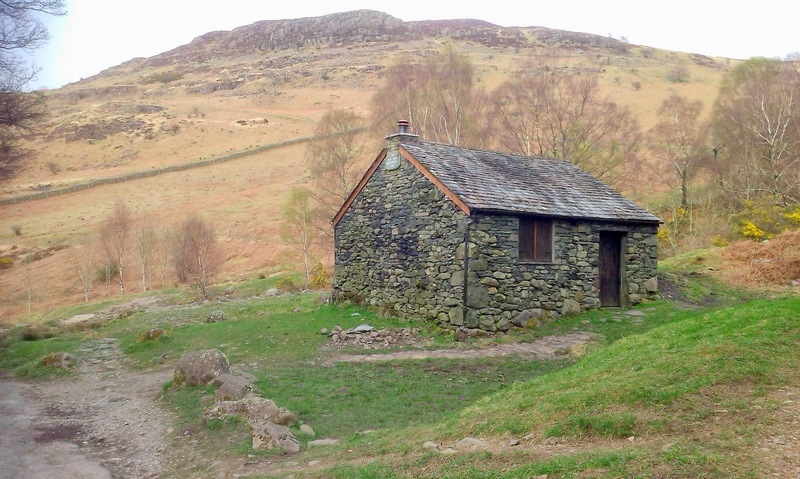 Much of our South Lakes property came from Beatrix Potter, the famous writer and illustrator of childrens books what is less well known is that she was an active farmer, Champion Herdwick sheep breeder and later in life the President of the Herdwick Sheep Breeders Association. Everything she turned her hand to, she did to the very best of her ability and sheep breeding was no different . Why she had such a passion for sheep breeding and Herdwcks in particular we don’t really know , I personally think that part of the reason was the uncanny resemblance of the Herdwick to her father Rupert , who was always the favourite of her two parents . Beatrix's father Rupert is the one on the right ! So sheep have, and will continue to play an important role in the story of the Lake District , the National Trust even has a ‘ landlords flock ‘ of herdwicks to ensure that this happens, but like all things it is a question of balance . In recent decades the number of sheep on the fells, encouraged by subsidieshas increased to a level that has had a negative impact . Sheep are not very selective in their grazing habits and will eat anything that is in front of them . Sweet fresh grass is preferred , but if that is not available they will eat other shrubs, flowers and young trees. Sheep in woodlands and gardens can wreak havoc in a short period of time , making it important that we maintain our woodland boundaries to a high standard and at some cost . Heavily grazed grassland on the fells and the valley sides means that there can be a very short grass sward a lack of diversity in terms of wild flowers and insects and a tendency for soil erosion to occur with tonnes of soil washed into our becks during heavy rain . Over a long period of time this means a massive loss of habitat and a loss of carbon stored in peat . Sheep numbers in recent years are starting to fall again but there is still much to do to minimise further damage and ensure more sustainable land management in the future , this will be a real focus of our work in the Trust in the Lake District in the coming years. Tree Guards and Tree Planting: The Howe Farm. 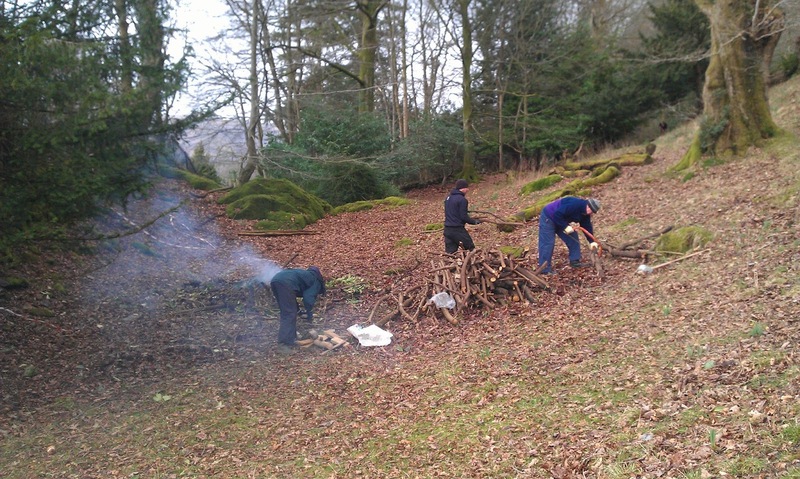 Rangers have recently been involved with a lot of tree planting and the construction of wooden tree guards on various Trust farms in the Windermere and Troutbeck area. The Howe, on the A592 Kirkstone Road, is one such farm where this work is taking place. This guard, under construction, is one of five in a field in which horses are kept...wider and stronger than most guards. Two of the guards protecting recently planted oak trees. A different style of guard by the stream...Troutbeck. Another guard under construction overlooking The Howe Farm. The last job was to replace the broken protective fence around possibly the oldest ash pollard in the area. The view from the ash pollard. Troutbeck Park Farm below the Troutbeck Tongue, with Yoke to the right. This farm has been the subject of several posts relating to tree planting and wood pasture. A close up view of this veteran tree. It has, over the years, become a precious wildlife habitat. Note the new growth from the base of the tree.